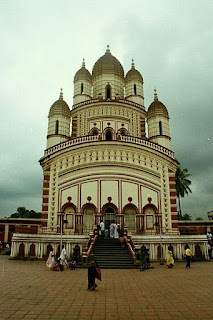 The Dakshineswar Kali Temple (Bengali: দক্ষিনেশ্বর কালী মন্দির Dokkhineshshôr Kali Mondir, Sanskrit: दक्षिनेश्वर काली मन्दिर) is a Hindu temple located in Dakshineswar near Kolkata. Situated on the eastern bank of the Hooghly River, the presiding deity of the temple is Bhavatarini, an aspect of Kali, meaning, 'She who liberates Her devotees from the ocean of existence i.e Saṃsāra'. The temple was built by Rani Rashmoni, a philanthropist and a devotee of Kali in 1855. The temple is famous for its association with Ramakrishna a mystic of 19th Century Bengal. The temple compound, apart from the nine-spired main temple, contains a large courtyard surrounding the temple, with rooms along the boundary walls. There are twelve shrines dedicated to Shiva—Kali's companion—along the riverfront, a temple to Radha-Krishna, a bathing ghat on the river, a shrine dedicated to Rani Rashmoni. The chamber in the northwestern corner just beyond the last of the Shiva temples, is where Ramakrishna spent a considerable part of his life. Ramakrishna came to the temple in 1855, as an assistant to his elder brother, Ramkumar, the head priest, a job he took over the next year, after Ramkumar's death. Profoundly affected by the dream, Rani immediately looked for and purchased land, and promptly began construction of the temple. The large temple complex was built between 1847 and 1855. The 20-acre (81,000 m2) plot was bought from an Englishman, John Hastie and was then popularly known as Saheban Bagicha, partly old Muslim burial ground shaped like a tortoise, considered befitting for the worship of Shakti according to Tantra traditions, it took eight years and nine hundred thousand rupees to complete the construction, and finally the idol of Goddess Kali was installed 31st May 1855, amid festivities at the temple formally known as Sri Sri Jagadishwari Mahakali, with Ramkumar Chhattopadhyay as the head priest; soon his younger brother Gadai or Gadadhar (later known as Ramakrishna) moved in and so did nephew Hriday to assist him. The next year, Ramkumar Chhattopadhyay died, the position was given to Ramakrishna, along with his wife Sarada Devi, who stayed in the south side of the Nahabat (music room), in a small room on the ground floor, which now a shrine dedicated to her. From then until his death 30 years later in 1886, Ramakrishna was responsible for bringing much in the way of both fame and pilgrims to the temple. 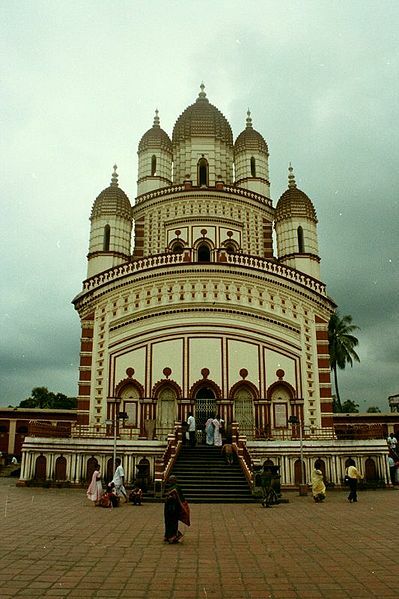 Dakshineshwar Kali Temple, built on a raised platform. Built in the traditional 'Nava-ratna' or nine spires style of Bengal architecture, the three-storeyed south-facing temple has nine spires distributed in upper two storeys, and stands on a high platform with a flight of stairs, over all it measures 46 feet (14 m) square and rises over 100 feet (30 m) high. The garbha griha (sanctum sanctorum) houses an idol of goddess Kali idol, known as Bhavataraini, standing on the chest of a lying Shiva, and the two idols are placed on a thousand-petaled lotus made of silver. Close to the main temple are the row of twelve identical Shiva temples built facing the east in the typical ‘Aat Chala’ Bengal architecture, they are built on either side of the ghat on the Hoogly river. To the North east of the Temple Complex is the Vishnu Temple or the Radha Kanta’s Temple. A flight of steps lead to the columned verandah and into the temple where a silver throne rests with a 21 and half inches idol of Lord Krishna and 16 inches (410 mm) idol of Radha.